For the jazz trumpeter and bandleader, see Teddy Riley (trumpeter). Edward Theodore Riley (born October 8, 1967) is an American singer, songwriter, record producer and multi-instrumentalist credited with the creation of the new jack swing genre. (Riley credits Barry Michael Cooper for giving it its name.) He fused hip hop and R&B in his production work with artists including Michael Jackson, Bobby Brown, Keith Sweat, Samantha Mumba, Doug E. Fresh, Today, Heavy D & the Boyz, Hi-Five, Men of Vizion and Profyle, as well as his spearheaded groups Guy and Blackstreet. Riley's consistency and drum ideas had some influence on modern-day R&B, which since him contained more samples and rapping segments as well as singing, a practice which in part was reminiscent of the Jackson family. Along with Neo Soul style of singers such as Marvin Gaye, he has had a seminal influence on gospel and R&B music, which became more open to using rap and sound effects in their recordings. Teddy Riley was raised in St. Nicholas Houses in Harlem. A child prodigy from the age of five, he began playing instruments in church. His uncle, who owned the famed Harlem club The Rooftop, built a studio in the club in which Riley would spend most of his time while growing up. By 14, upstate[dubious – discuss] New York rappers began making music to his tracks. Under the guidance of local music producer Gene Griffin, Riley formed the short-lived group Kids at Work. At the age of 17, Riley produced Kool Moe Dee's 12" single, "Go See the Doctor". Released on an independent label in 1986, the song became a crossover hit, reaching No. 89 on the Billboard Hot 100. Riley had previously worked on the production of Doug E. Fresh and the Get Fresh Crew's "The Show" in 1985. In 1987, Riley, Aaron Hall, and Timmy Gatling (who would later be replaced by Hall's brother Damion Hall) formed the R&B group Guy. Managed by Gene Griffin, Riley's work with Guy pioneered the "new jack swing" style of R&B, which had been showcased previously in Riley's productions for Keith Sweat ("I Want Her"), Johnny Kemp ("Just Got Paid"), Bobby Brown ("My Prerogative") and others. Riley infused his own unique blend of hip-hop beats, R&B progressions and the gospel vocal stylings of Hall to create the archetypal new jack swing sound on Guy's eponymous debut. In 1989, Riley produced Big Daddy Kane's "I Get The Job Done", as well as other work for The Jacksons, The Winans and James Ingram. He also created the highly successful remix of Jane Child, "Don't Wanna Fall in Love", which became a crossover pop smash. After the release and tour of Guy's second album, The Future, Riley co-produced half of Michael Jackson's Dangerous album on the recommendation of Jackson's long-time producer Quincy Jones, who had then appeared in 4 of Guy's music videos. Featuring the Riley co-produced singles "Remember the Time", "Jam" and "In the Closet", Dangerous remains the most successful new jack swing album of all time with 32 million copies sold. After the disbandment of Guy in 1992, Riley moved to production, performance on and promotion of Wreckx-N-Effect's second album Hard or Smooth. Based in Virginia by this time, Riley discovered The Neptunes during the making of Wreckx-N-Effect's smash hit single "Rump Shaker". In late 1991, Riley formed a second group, Blackstreet. The group would go on to release several major hits, including "Don't Leave Me" (1997), the number one single "No Diggity" (1996, featuring Dr. Dre and Queen Pen), and "Girlfriend/Boyfriend" (1999, with Janet Jackson, Eve, and Ja Rule). By 2011, the group had disbanded and reformed several times. In 2000, Riley worked with Spice Girl Melanie B on three tracks – "ABC 123," "I Believe" and "Pack Your S**t"—for her solo debut album, Hot. He also worked on an album with Outsiderz 4 Life, producing "Wil' Out" and other songs. 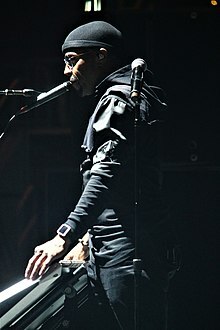 At the start of 2006, he was part of the New Jack Reunion Tour, featuring Blackstreet and Guy, in addition to After 7, SWV, and Tony Toni Toné. In May 2006 Riley announced that he would be working on two key projects: a new Blackstreet album and a new Guy album. In June 2008, a fire destroyed Riley's Virginia Beach recording studio. Fire investigators said that an electrical problem caused the blaze that burned the abandoned recording studio. The Virginia Beach Fire Department said lightning in the area also could have been a factor, although there was no direct strike. The empty studio was for sale and was insured for $336,000. In 2009, Riley performed with Guy at the BET Awards. In the same year, Riley worked with Amerie and Robin Thicke on their respective albums. Leading on from his work on Snoop Dogg's album Ego Trippin', Riley became part of the production supergroup QDT, which features DJ Quik as well as Snoop Dogg. Riley produced and co-wrote the song "Teeth" with Lady Gaga for her EP The Fame Monster. Speaking in March 2010 to Blues & Soul's Pete Lewis – Riley said that he was no longer affiliated with Guy (Riley had last performed with the group in October 2010). Riley also said that the current line-up of Blackstreet consisted of himself, Chauncey Hannibal, Dave Hollister and Sherman 'J-Stylz' Tinsdale. He confirmed that he was working on a new Blackstreet album, though intended to release his own album – entitled 'TRX' – first. Artists he could possibly be working with for the project included Stevie Wonder and Elton John, plus his own new, upcoming acts. However, Hannibal stopped performing with the group and the lineup became Riley, Hollister, Mark Middleton and Eric Williams. In 2012, Hannibal returned to Blackstreet. Middleton and Williams left the group. The group's lineup now consists of original members Riley, Hannibal, Hollister and newest member Glenn Adams, aka Lenny Harold. In an August 2010, co-executor of the Michael Jackson estate, John Branca, confirmed that a posthumous album of Michael Jackson would be released, containing work done in the previous five years with producers Neff-U, Christopher "Tricky" Stewart and Riley, as well as work written and produced solely by Jackson himself. The album Michael was released on December 14, 2010 in the United States. After the release, several people questioned some of the music Riley produced for the project. Riley insisted all of the songs were sung by Jackson and claimed that vocal artifacts were added from overprocessing Jackson's voice. However, Riley made comments in an interview with Dan Dodds (aka Soul Jones) in which he stated that there were some elements of his voice in the music. "They may use some elements from me, put together ideas but I haven't been working on the new album" Riley is reported to have said. Recently, Riley has stepped into the Korean music market. Riley worked with singer/rapper Jay Park on an English track titled "Demon", which was originally meant for Michael Jackson. Riley produced a mini album for the Korean girl group Rania. Riley is one of the producers part of the production team QDT, with DJ Quik and Snoop Dogg. He produced the tracks "Believe" and "Flow" for the Twenty album of the R&B group Boyz II Men. He has also produced Korean girl group Girls' Generation's single "The Boys" for the group's first international release. He has also produced songs for Girls' Generation's labelmates SHINee and EXO. He worked with Shinee on "Beautiful", "Shine" and "Dangerous" from their two part third Korean studio album. Riley also produced the songs "MILK" and "All Night" for f(x)'s third studio album Red Light and "What Is Love" for Exo's prologue single. ^ Hogan, Ed. "Teddy Riley: Biography". Allmusic. allmusic.com. Retrieved March 7, 2014. ^ Bush, John. "Kool Moe Dee > Biography". Allmusic. San Francisco, California: All Media Network. Retrieved October 24, 2018. ^ "Teddy Riley New Jack Swing Hip Hop part 1". YouTube. Retrieved 2012-12-24. ^ "Michael Jackson sulla sedia a rotelle". AffarItaliani.it. July 11, 2008. Retrieved May 10, 2009. ^ Carter, Kelley L. (August 11, 2008). "New jack swing". Chicago Tribune. Chicago, Illinois: Tronc. Archived from the original on October 3, 2009. Retrieved August 21, 2008. ^ "Melanie B – Hot (CD, Album) at Discogs". Discogs.com. October 9, 2000. Retrieved December 24, 2012. ^ "Electrical problem caused fire at Riley studio in Va. Beach". WVEC. July 16, 2008. Archived from the original on February 20, 2009. ^ "Keith Sweat, Guy and BBD Medley". BET. New York City: Viacom. Archived from the original on July 6, 2009. ^ "Teddy Riley & BLACKstreet: No Doubt". Bluesandsoul.com. Retrieved December 24, 2012. ^ "Soul Jones Words: Will The Real Blackstreet Please Stand Up? – Teddy Riley & Chauncey Hannibal Interview". Souljoneswords.blogspot.com. May 27, 2011. Retrieved 2012-12-24. ^ Dong-hee, Hong. "걸그룹 '라니아' 국내 최초로 한ㆍ미 동시 데뷔-프린트화면". biz.heraldcorp.com (in Korean). Retrieved August 12, 2017. ^ 7, hotshotlover30 April; 2011 (April 7, 2011). "Teddy Riley's International Girl Group RANIA's Debut Showcase". Soompi. Retrieved August 12, 2017. ^ "Teddy Riley, Snoop, T-Pain Link With Korean Superstar Jay Park". AllHipHop.com. April 20, 2010. Retrieved December 24, 2012. ^ "[Update: MV] Rania releases debut single, "Dr. Feel Good"". Allkpop.com. April 5, 2011. Retrieved December 24, 2012. ^ "Teddy Riley praises TVXQ, Big Bang, & Yangpa after visiting "Inkigayo" set". Allkpop.com. April 27, 2011. Retrieved 2012-12-24. "'Round and 'Round (Merry Go 'Round of Love)"